-Pressing flowers & botanicals to create wondrous works of natural art. 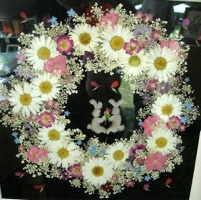 Janet & Haruhiko Murakami have been creating these incredible flower frames for more than 10 years. Janet was so kind to share with me, her knowledge & some techniques at a recent craft show in Bangor Maine.